Rue should be gathered just as the flower buds start to bloom in the spring or early summer, depending on where you live. Let yourself pause for a moment and consider the centuries long line of wise women, herbalists, gardeners, and healers who have stood, just as you stand now, ready to reap this ancient plant as a defense against pain, pestilence, and evil minded witches. You don't have to put much stock in the magical properties of rue to feel the powerful connection you are making with the past when you continue the tradition of making use of rue. I will dry a small amount to put away for use in winter tea, but the majority of the rue will be infused into oil, vinegar, or made into liniments for external applications. Rue oil eases the pain of arthritis, headaches, and general aches and pains. It is anti-inflammatory, antiviral, and antibacterial and helps to protect against free radicals. Rue oil has been used to treat varicose veins as well. 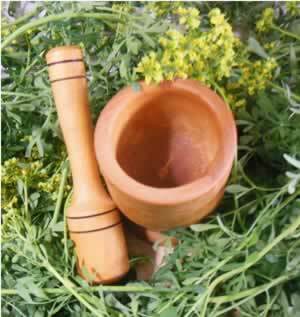 Cautions: Rue is a powerful herb! Contact with the leaves can irritate sensitive skin, test on a small patch before widespread use. Rue oil is for external use only. Recipe Instructions: Herbal Oil Infusions :Harvest by cutting 3 to four inches of the newest green top stems, leaves, and flowers. Let wilt on the stems for 24 hours to decrease the amount of water and let any critters depart peaceably. Combine rue, oil, and vodka a wide mouth jar or pan, covering loosely to allow for water evaporation. Infuse with a low steady heat of apx. 100 degrees F. (oil should be hot, but never near smoking). After 10 to 14 days strain well, and store in a clean bottle in a cool cupboard.